A recent academic paper finds evidence for a relationship between the volume of news mentions of certain stocks and the volume of trading size of price change in those stocks. 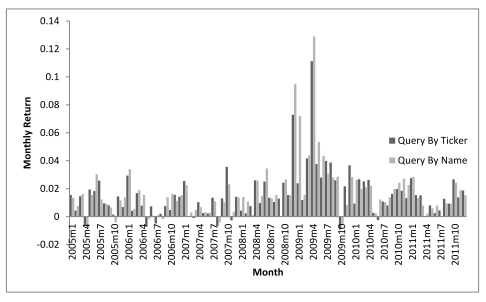 There have been quite a few papers on the relationship between news or information searching and market movements. But this paper, Quantifying the Relationship Between Financial News and the Stock Market, tries to measure the relationship. They tracked mentions of the companies in the Dow Jones Industrial Index and the corresponding movements in volume and price for these companies on the NYSE for the same day and the following day. They found evidence for a relationship between the number of mentions of a company on a day and both the volume of trading and size of price change for a company’s stock on the same day. 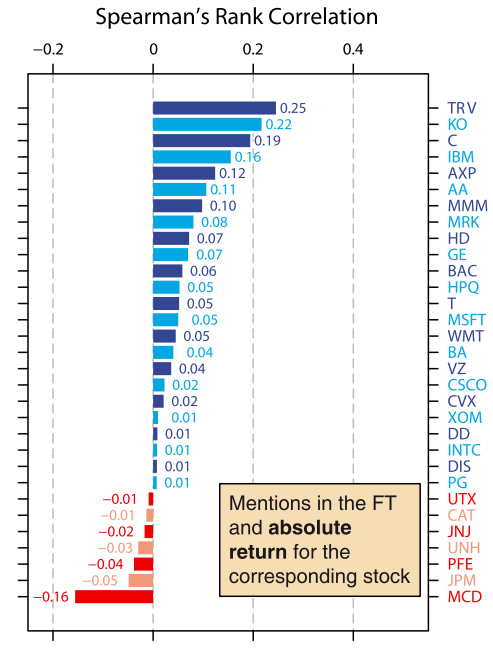 The following figure from the paper shows the ranking of DJIA companies according to the correlation between FT mentions and absolute movement in the stock price. The strongest correlation among the DJIA companies they found was for Bank of America. The paper concludes with the qualification that their analyses do not allow them to draw strong conclusions about whether news influences the markets, or the markets influence the news; but they propose that movements in the news and movements in the markets may exert a mutual influence upon each other. 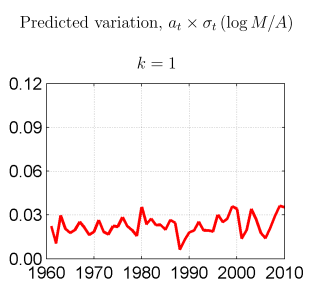 A recent academic paper, Have Financial Markets Become More Informative?, found that the extent to which stock and bond prices predict company earnings has not increased since 1960. The primary role of the capital market is allocation of ownership of the economy’s capital stock. In general terms, the ideal is a market in which prices provide accurate signals for resource allocation: that is, a market in which ﬁrms can make production-investment decisions… under the assumption that security prices at any time ‘fully reﬂect’ all available information. So, in an ideal market prices convey information which drives investment which results in economic growth. Financial markets have developed tremendously in the last few decades, reducing the cost of trading and increasing liquidity. Information technology now delivers data quickly and cheaply. So, given these developments the authors ask if market prices have become commensurately more informative. Or, to put it another way, have prices become better at predicting earnings? To research this the authors analysed data for the S&P 500 companies since 1960. The following figure from the paper shows the equity market-predicted variation, which measures the size of the predictable component of earnings that is due to prices, or total price informativeness in the model. The research shows that while market prices are positive predictors of future earnings, there is no evidence of an increasing trend in equity price informativeness. The authors conclude that their findings contradict the view that improvements in financial markets (e.g. liquidity) and information technology have increased information production. Finally, the authors ponder why this might be; their suggestion is that while our ability to store and transmit information has undoubtedly improved, the important thing for investors is the interpretation of information *. Bai, Jennie and Philippon, Thomas and Savov, Alexi, Have Financial Markets Become More Informative? (November 2013). 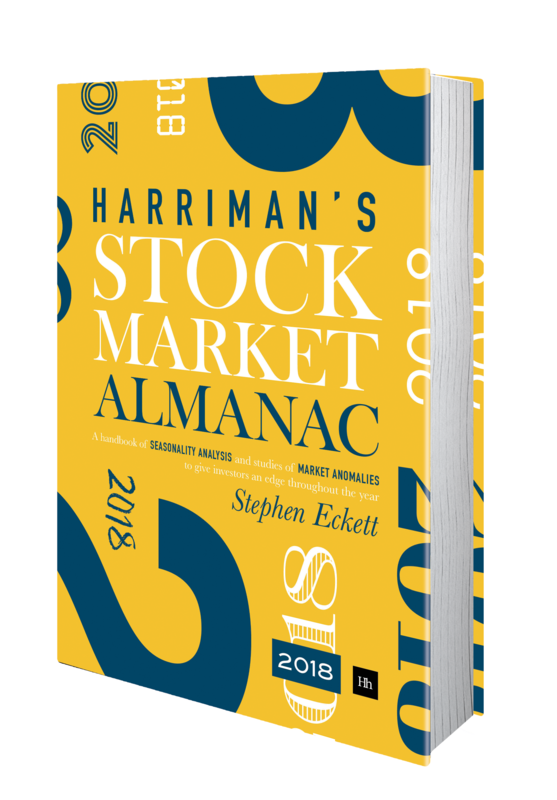 * I would just point out that the current best-selling book on investing is The Intelligent Investor by Benjamin Graham, a book first published in 1949. Does an increase in newsflow on a stock anticipate increased returns? In today’s computerised world it is easy to monitor the amount of newsflow on particular stocks. It is also possible, using tools like Google Trends, to monitor active interest in stocks. For example, the following chart shows the number of Google searches on “AAPL” (the ticker for Apple) since 2005. But can this information be used to predict share price behaviour? Research by Yanbo Wang of INSEAD suggests it can. on specific companies. His research found that an increase in the pair of supply and demand of newsflow resulted in subsequent abnormal returns for stocks. The results are consistent with the hypothesis that an increase in information supply drives stock prices up only when an increase in information demand confirms that information supply succeeds in raising new investors’ awareness and existing investors’ additional learning effort. The above portfolio generated abnormal annual returns of 16%-22%. This increased to 23%-34% when the portfolio was restricted to smaller stocks.